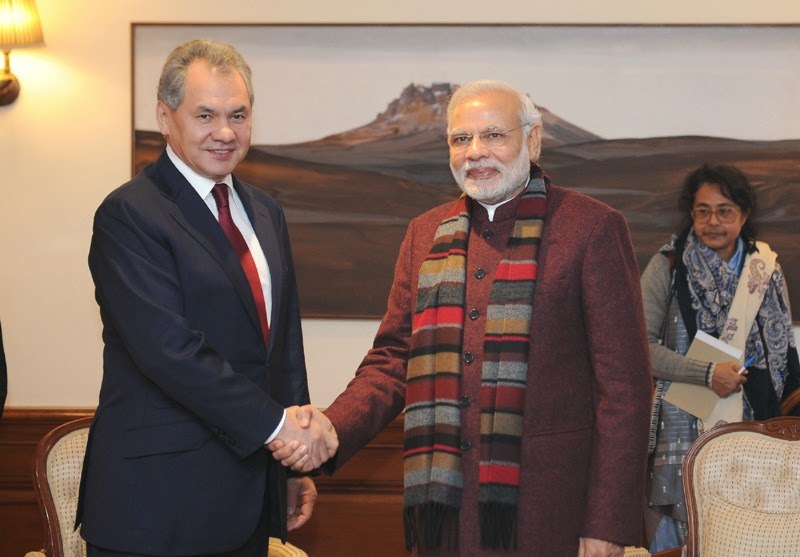 Defence Minister of the Russian Federation Mr Sergei Shoigu called on Prime Minister Narendra Modi today. Prime Minister Modi recalled a very successful visit of the Russian President Vladimir Putin to India in December 2014 and conveyed that the time tested special and privileged strategic partnership between India and Russia acquired a new momentum with the visit of President Putin. Prime Minister conveyed that he looked forward to visit Russia later this year for the 7th BRICS summit and for the bilateral Annual Summit. Mr Sergei Shoigu is visiting India for the 14th meeting of the Inter Governmental Commission on Military and Technical Cooperation which is co-chaired by the Defence Minister of India. The Defence Minister of Russia, Mr. Sergei Shoigu calls on the Prime Minister, Shri Narendra Modi, in New Delhi on January 21, 2015.